Lock in a great price for Hotel Negresco - rated 8.7 by recent guests. The hotel is absolutely stunning. Every detail has been thought of and attended to. The staff are wonderful and give exceptional service as standard. Easily the most comfortable bed I've ever slept in! Arrested beauty... "We gaze and turn away, and know not where. Dazzled and drunk with beauty, till the heart Reels with its fullness , there - for ever there - Chain'd to the chariot of triumphal Art, We stand as captives, and would not depart." ... The best hotel I have stayed in. Each floor designed to a different époque. They had me believing I was Napoleon Bonaparte by the time I was leaving. Great location. It's more than a hotel.Amazingly friendly, supporting staff. Location of Negreso is excellent. Besides, fine paintings and furnitures displayed in the hotel was interesting. Breakfast was prepared in a large, comfortable room. We enjoyed kind pospitality of the stuff. I liked the location. I liked the staff attentiveness. I liked the ocean view. The location was very convinient. The staff was very helpful and respectful. The hotel is indeed an open art show. Have stayed 5 times before. The building, art treasures and good are fantastic. Buffet breakfast good and food was fresh. For an hotel like this I would expect more. Cocktails at the bar amazing! Restaurante chantecler was wonderful! Bedroom was clean. The facilities at the hotel and of course the location . 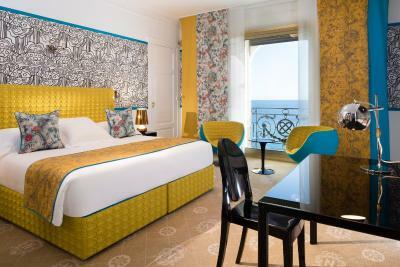 One of our top picks in Nice.The famous Hotel Negresco, dating from the beginning of the 20th century, overlooks the beach and the Promenade des Anglais in Nice. From Louis XIII style to modern art, 5 centuries of history are exhibited throughout the hotel. Free Wifi access is provided and there is an on-site fitness centre. 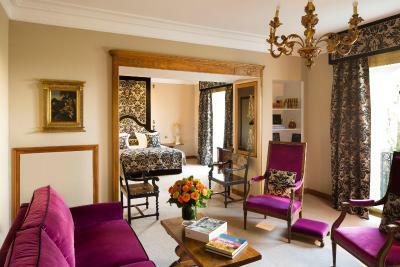 Each room and suite is decorated individually with period furniture, and features air conditioning and a four-poster bed. Rooms are also equipped with a flat-screen TV and a private bathroom. A fresh buffet breakfast is served each morning in La Rotonde restaurant, where guests can watch the chef cook. Gourmet meals and drinks can also be enjoyed in the British-style bar Le Relais, or at Le Chantecler restaurant, which is recognised with 2 stars by the Michelin guide. Hotel Negresco's guests can benefit from access to the Neptune private beach area, at an extra cost, where water sports can be enjoyed. 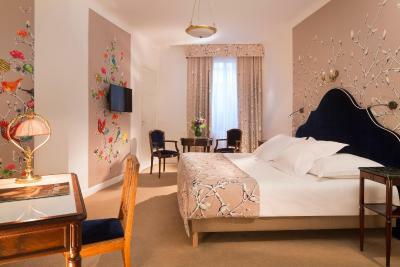 The hotel is a 15-minute walk from Nice’s Old Town and Nice-Ville Train Station. Nice Côte d'Azur Airport is just 3.1 miles from the hotel. A private limousine shuttle service is available for guests for a surcharge upon request. Private parking is available on site. This property also has one of the best-rated locations in Nice! Guests are happier about it compared to other properties in the area. Hotel Negresco has been welcoming Booking.com guests since 6 Oct 2009. When would you like to stay at Hotel Negresco? This room overlooks the interior façade. Private parking is possible on site (reservation is needed) and costs EUR 28 per day. This room reflect the "Negresco spirit" as imagined by Madame Augier. Its décor is from the Louis XIV era and has authentic furniture. It overlooks the gardens of Palais Massena with its century-old palm trees and also the Bay of Angels in the background. This room has a salon area with a mix of contemporary and antique furnishings. It overlooks the interior dome of the Negresco. An extra bed is possible in this room upon request. 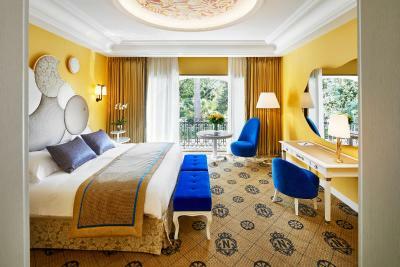 This room is decorated in soft colours with silk or velvet fabrics and has views of the Bay of Angels. A spacious, south-facing suite with a sea view. It includes a queen-size bed, a seating area and a minibar. This room comes with free parking included in the price. 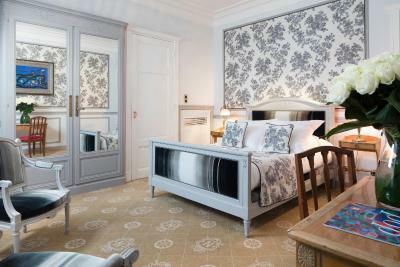 Richly furnished with unique 18th-century French pieces and Sèvres porcelain, this suite features a Louis XVI bed in a spacious bedroom, a private lounge, and a furnished terrace with views of the sea, palm trees and the Promenade des Anglais. This room comes with free parking included in the price. 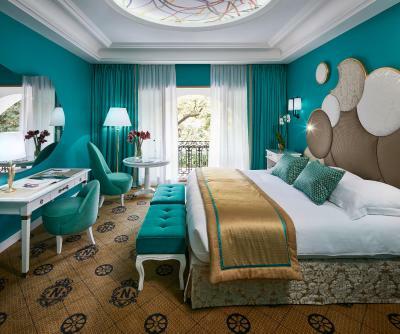 Decorated with elegant draperies, this suite features a separate living room and sea views. This room also includes free parking. Each suite has a living room and is uniquely decorated with rare furniture. It offers large windows or balconies with views of the Bay of Angels. This room also includes free parking. House rules Hotel Negresco takes special requests - add in the next step! All older children or adults are charged EUR 95 per person per night for extra beds. Hotel Negresco accepts these cards and reserves the right to temporarily hold an amount prior to arrival. Please note all the rooms are different and the actual rooms may differ from the photos. The fitness centre is open from 07.00 to 21.00 daily. Guests will be given a bottle of water and can reserve a personal fitness coach. The view from the balcony is beautiful and the location is excellent to take a morning walk. Enjoyed interior of the hotel like art museum. If it is your first visit to Nice, would recommend to stay here. La Rotonde restaurant was closed for refurbishment which was disappointing but breakfast was served under the beautiful glass dome of the Salon Royal as an alternative. Chairs provided in the room was premium, but not so comfortable for good rest. as mentioned in previous note. The hotel is a walk in museum. Full of antiques anywhere you turn to. The food and service are outstanding, with full attention to all the details. Last but for sure not least a very spacious bed, and very comfortable pillows. We were forced to cut our last night because the chinese emperor visited. We had twice problems with the light in the bathroom. The beach in front of the hotel is magnificent. You have the feeling that you live in a museum. The hotel was below than what I expected. I thought the hotel would be a reflection of the golden era of Cote d'Azur, yet the glory had faded away. The furniture got very old and apparently unkempt. The doors in the rooms had lost its stability. The breakfast was very very standart. The hotel just couldn't make me live the luxury and elegance at the same time, which I was looking for.